Master teachers from around the globe come to teach and inspire intermediate & advanced dancers ages 12 – adult. Workshops in American Masters such as Martha Graham, Humphrey/Weidman, European Physical Theater, Corporeal Mime…and more. Single Master Classes, changing with every Kanopy Dance Company performance, gives the student an opportunity to take a class with a featured guest artist and to try something new. Kevin Predmore (Principal Dancer, Buglisi Dance Theatre) holds a Master from SUNY Purchase, is a founding member of BDT and has been instrumental in the creation of many of their dances. 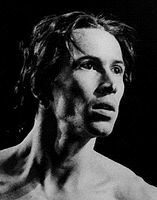 He has performed nationally and internationally with the Martha Graham Dance Company, Pearl Lang Dance Theater and Pascal Rioult Dance Theatre among others. He has worked with Sophie Maslow, Stuart Hodes, Moses Pendleton, Daniel Nagrin, and Max Luna III. With Virginie Mécène, Kevin co-produced Profiles, an evening of solos and duets at the Sylvia & Danny Kaye Playhouse, and Offering, An Evening of Dance, in Kobe and Hiroshima, in Japan. Mr. Predmore has also taught as a faculty member at the Martha Graham School as well as at Ballet Hispanico and currently is on the faculty of The Ailey School where he teaches Graham Technique as well as Composition, Modern Partnering and serves as a Faculty Advisor to the International Independent Students.